I seldom fry foods any more, but last night, we were hungry for some fried catfish. To me, the perfect fried catfish has one essential ingredient ~ cornmeal. It adds great texture and crunch. However, Bill disagrees and tends to prefer catfish dusted with flour. This time, we met in the middle and I used a coating of half cornmeal, half flour. The catfish was delicious and made us both happy! In a large bowl, soak catfish in enough buttermilk to cover, for one hour and drain well. Pour oil in a cast-iron skillet heat until oil is hot. Dredge fish in flour mixture. Gently place fillets in hot oil. Pan-fry for 3-4 minutes on each side, or until golden brown and fish is flaky. Fry the fish in batches, adding more oil if necessary, until done. Remove from oil and drain on paper towel-lined plate. Serve hot with tartar sauce. The color of paprika is a nice addition to many dishes, and Hungarian sweet paprika is used in this dish. It adds a warm, sweet, peppery, pleasant taste to the potatoes as they roast. There is just enough olive oil to crisp them up into a great side dish. This is a simple roasted potato recipe with great results. If you’ve never eaten roasted potatoes, you’re in for a treat! Cut potatoes into 1-inch chunks, leaving the skin on. Place potatoes and garlic on baking sheet and toss to coat with oil. Combine remaining 3 ingredients, sprinkle over potatoes, and toss. Bake for 50 minutes to an hour or until fork tender and a crisp golden brown. Do you like potato soup??? Mmmm! Nothing quite beats a simple rustic frittata! Paella is of Spanish cuisine, originating in Valencia. It’s traditionally made with rice, meats and vegetables; it’s cooked in a large pan called paella: a broad shallow dish with sloping sides, 13-inches in diameter, or larger. Prepare rice according to package directions; let cool for 5 minutes. In a 12-inch non-stick skillet, sauté sausage, breaking into small chunks while it cooks. Add onion and bell pepper and cook until softened and meat is fully cooked. Add shrimp and rice to skillet and mix well. Beat eggs in a bowl and add salt, pepper and paprika. Place under broiler and cook until center is set or bake in the oven at 400 degrees for 10-15 minutes until knife inserted in center comes out clean. Let set for 5 minutes, cut into wedges and serve. I’m happy to say Bill and I celebrated our 46th wedding anniversary yesterday! All this time with the best husband: thank you for all the wonderful years and wonderful memories, my dear, with many more to follow! 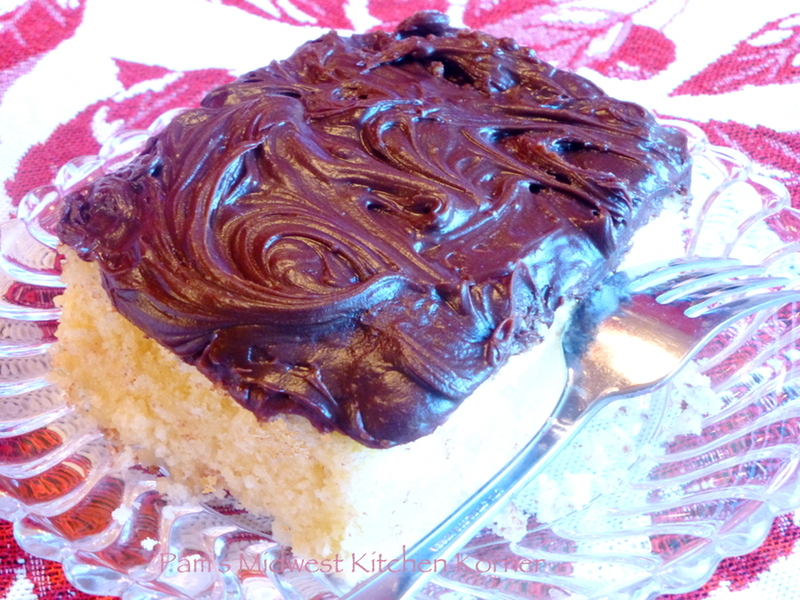 In Bill’s opinion ~ there is no cake better than a yellow cake with dark chocolate frosting. This recipe is from The America’s Test Kitchen Family Cookbook. This is the lightest, fluffiest cake with the finest crumb you can imagine! In my opinion ~ it beats any bakery cake! I made a sheet cake in a 9-inch x 13-inch pan; however, if you prefer a layer cake, this recipe makes a 2-layer cake. Along with the cake flour, it has its share of butter and eggs to provide a tender and springy texture with a stand-out buttery flavor. Then finish the cake with sinful chocolate frosting, and you’re treated with a scrumptious cake that would make about anyone happy! Adjust an oven rack to the middle position and heat the oven to 350F. Lightly coat a 9 x 13-inch cake pan with shortening and dust with flour. Whisk the flour, baking powder and salt together in a large bowl and set aside. Beat the butter and sugar together in a large bowl with an electric mixer on medium speed until light and fluffy, 3-6 minutes. Beat in the eggs, one at a time, until incorporated, scraping down the bowl and beaters as needed. Beat in the vanilla. Reduce speed to low and beat in 1/3 of the flour mixture. Beat in half the milk. Repeat with half of the remaining flour mixture, then the remaining milk, and finally the remaining flour mixture. Give the batter a final stir using a rubber spatula to make sure it's thoroughly combined. Pour the batter into the prepared pans and smooth the top. Bake until a wooden skewer inserted into the center of the cakes comes out with a few crumbs attached, 25-30 minutes. Let cool completely before frosting, 1-2 hours. Stir the melted chocolate, vanilla and salt together in a small bowl until the salt dissolves. Beat butter with an electric mixer on medium-high until smooth, 30-60 seconds. Reduce speed to medium-low, slowly add confectioners’ sugar, and beat until smooth, 2 to 5 minutes. Add cocoa and continue beating to blend. Increase speed to medium-high and beat until the mixture is light and fluffy, 4 to 8 minutes. It’s a classic all-American cake! Bill’s first choice of pasta is angel hair, and he likes shrimp mingling with tomatoes, so this dish is indeed a favorite here! By the way, the Italian name of the pasta is Capelli d'angelo, as great a name as “angel hair.” It’s “nearly invisible spaghetti” that goes well with this sauce. And, I really like the sauce in this dish, as it is not so “liquefied” ~ it has substance, thanks to the cornstarch blending the ingredients well. Sometimes, I substitute ½ cup white wine for the water. The white wine for drinking, not cooking: it’s salty and contains additives. And, since wine is slightly acidic, I then add a touch of brown sugar to the sauce. Heat olive oil in a large skillet, add onions, bell pepper, and garlic, cook 2 minutes. In a small bowl, stir cornstarch into stock until dissolved, add water and pour into skillet. Combine well and cook for 1 minute, until just slightly thickened. Blend in tomatoes and remaining ingredients. Simmer on low heat for 10-15 minutes, stirring occasionally. Meanwhile, cook pasta in boiling water until al dente. Drain well and return to pot; cover to keep warm. Add shrimp to skillet mixture and cook until pink. Does your family compliment your cooking after dinner? Do you compliment the person who has cooked a meal for you?